We are Exporter of the T-Shirt Bag product. • Strong, high-density gusseted bag resists punctures and tears.• Large handles for easy carrying.• Reusable and recyclable. Specifications:-1. Material: HDPE, LDPE & Biodegradable 2.Size as per customers request. 3.Printing as per customer's request.4.Film Color as per customer's choice. 1.We are Manufacturer of the Material, hence Competetive Pricing. 2.Fast Completion Time & timely delivery. 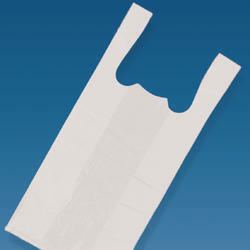 The bags are widely applicable to public utilities such as for books, groceries, pharmacy or supermarkets, etc. Dual Side gussets of T-Shirt Bags or Cut Handle Bags help the bags expanding in both directions for more space. The bags can be advertised by printing logo or advertised wording of the Shops or Firm’s name. We are the supplier & manufacturer of T-Shirt Bags in Punjab, Chandigarh, Panchkula, Baddi, Solan, Nalagarh & all over North India. We are manufacturers & suppliers of T-shirt bag made from prime grade or 100% virgin & recyclable material. - Printing upto 12 colors OR 6 + 6 colors with flexo or roto cylinder. 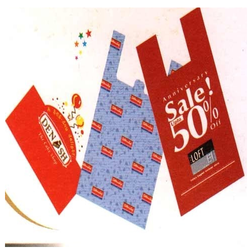 Our company offers T-Shirt Cut Bags that are manufactured using quality fabrics. These are appreciated among our clients for their distinctive characteristics such as strong wear and tear resistance, light permeable property, protection against insects, economical, eco-friendly and resistance to moisture. We are offering these bags at most reasonable rates. The company is a well-reckoned Manufacturer and Exporter of premium T-Shirt Bag in India. The T-Shirt Bags are high in quality and available in a wide range of designs, prints, colors, and sizes.